Have you ever stopped to think about the benefits of writing by hand? 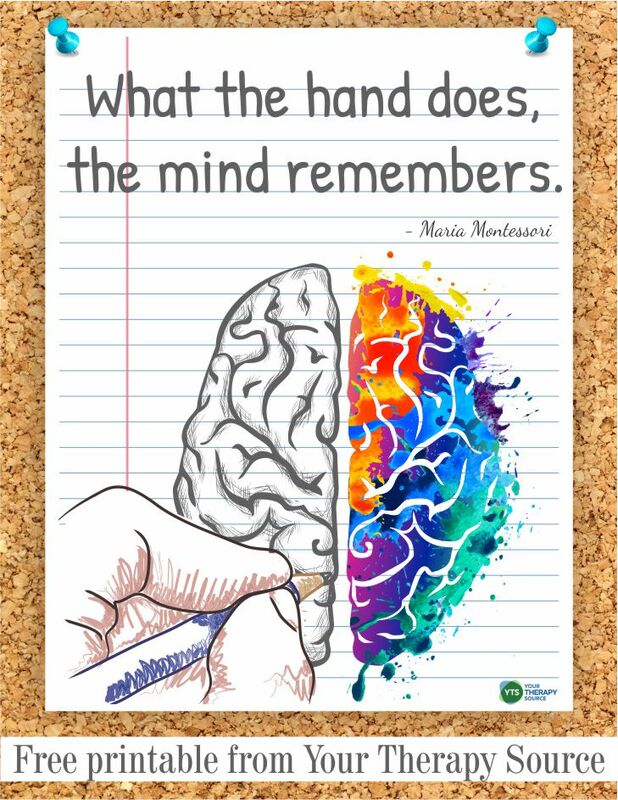 Maria Montessori said it best with “what the hand does the mind remembers” (download a FREE copy of this poster for your school at the bottom of the post). Technology has started to take over our lives. Are students and adults losing out on the benefits of writing by hand? In today’s technology-focused society, do you wonder why bother writing by hand? We have voice activation, voice to text, smartphones, tablets, and laptops. Who needs a pencil when you have a keyboard? There are research studies that indicate the benefits of writing by hand instead of keyboarding. Evidence indicates that there are many benefits of writing by hand. Research indicates that when comparing handwritten notes to laptop notes, laptop note-takers performed significantly worse on conceptual questions. The laptop notes contained more words and more verbatim overlap with the lecture when compared to the notes that were written by hand. Students who took more notes performed better, but so did those who had less verbatim overlap, suggesting that the benefit of having more content is canceled out by “mindless transcription.” The results even stayed the same when the researchers explicitly instructed the students to avoid taking verbatim notes. Longhand note takers still beat laptop note takers on recall one week later when participants were given a chance to review their notes before taking the recall test. A study in the Journal of Educational Psychology found that students who participated in 27 weeks of 15-minute handwriting sessions made greater gains when compared to the control group in handwriting as well as compositional fluency immediately following instruction. Gains were still present 6 months later whether the student was or wasn’t identified with a disability. The researchers concluded that handwriting is causally related to writing. It is important to provide explicit and supplemental handwriting instruction in order to prevent writing difficulties in the primary grades. Did you know that research has indicated that perceptual and motor systems become linked only when individuals learn through self-generated actions? Basically, we learn more by doing an activity ourselves versus watching someone else complete the same exact activity. Some research has demonstrated that we learn symbols better if we write them by hand during learning than through other forms of practice, including visual, auditory, and even typing. Using brain imaging, researchers concluded that the visual regions that are active during letter perception (the fusiform gyrus) become functionally connected to motor regions only as a result of handwriting experience. Further research indicated that the reason handwriting creates these connections is that children are forming many different variations of the same letter versus tracing and typing where it does not vary. The researchers concluded that handwriting experience plays a crucial role in the formation of the brain network that underlies letter recognition. Graham, S., Harris, K. R., & Fink, B. (2000). Is handwriting causally related to learning to write? Treatment of handwriting problems in beginning writers. Journal of Educational Psychology, 92(4), 620-633. James, K. H. (2017). The Importance of Handwriting Experience on the Development of the Literate Brain. Current Directions in Psychological Science, 26(6), 502-508. 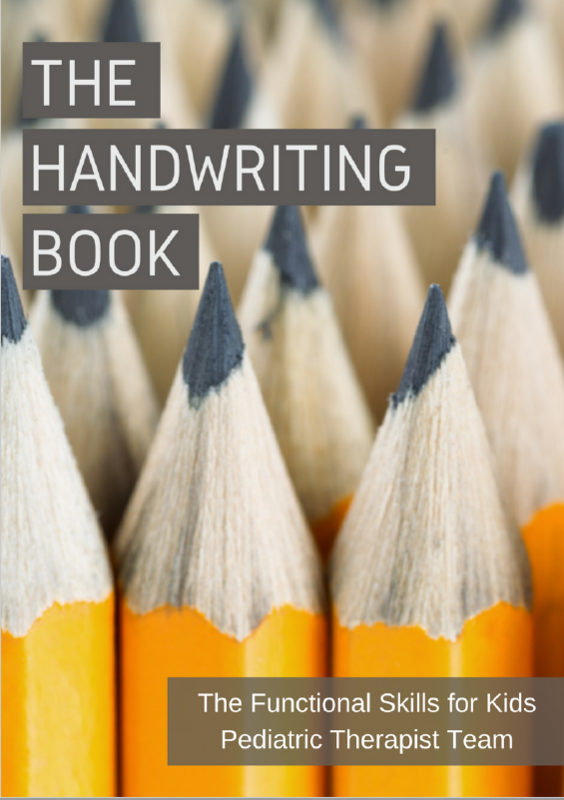 Designed to be an effective, easy-to-use resource, The Handwriting Book is suitable for any parent, educator, or therapist. Ideas for activities, strategies, modifications, and adaptations for children of all ages are included alongside explanations of each aspect of handwriting. 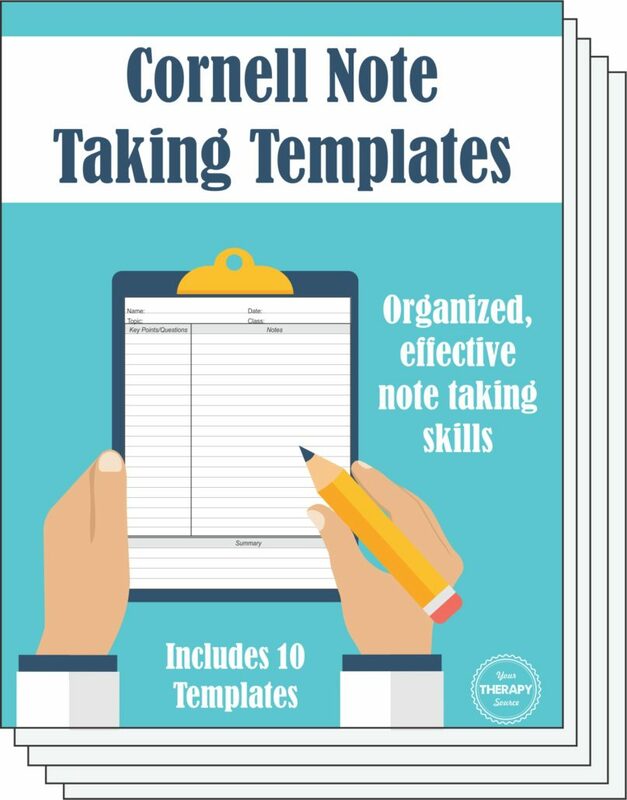 Each chapter includes helpful therapist tips to make handwriting practice more engaging and fun. This Handwriting Station Bundle will save you TONS of time with these NO-PREP activities that encourage handwriting practice for your students. Set up a handwriting station in the classroom or at home so students can practice handwriting throughout the day in the classroom. Great for early finishers! 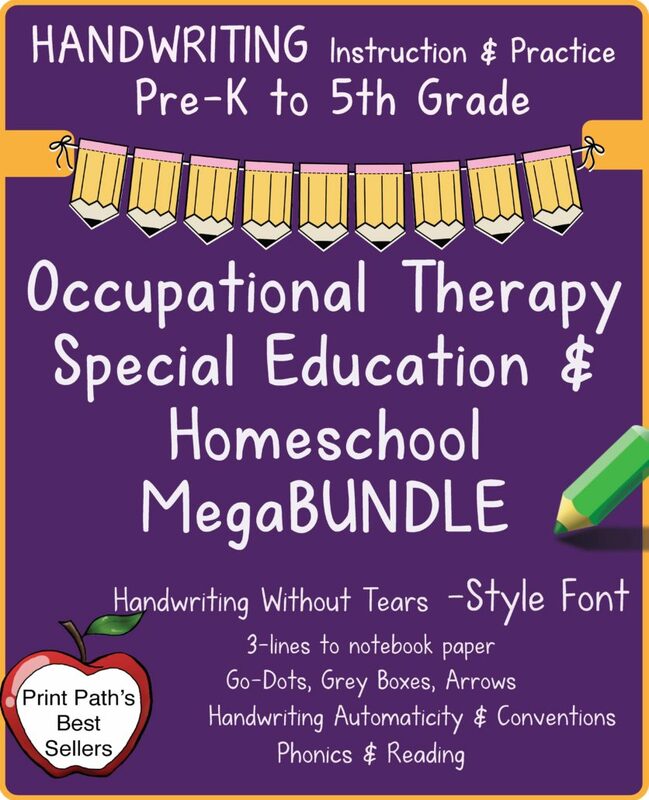 Handwriting Bundle for PreK-5th Graders is created by school-based Occupational Therapist, Thia Triggs of Print Path. This Handwriting Without Tears© -style letter font, uses 3-lines to best support your students. There are Go-Dots, Gray-Boxes, and Simple Arrows that inform rather than confusing learners. 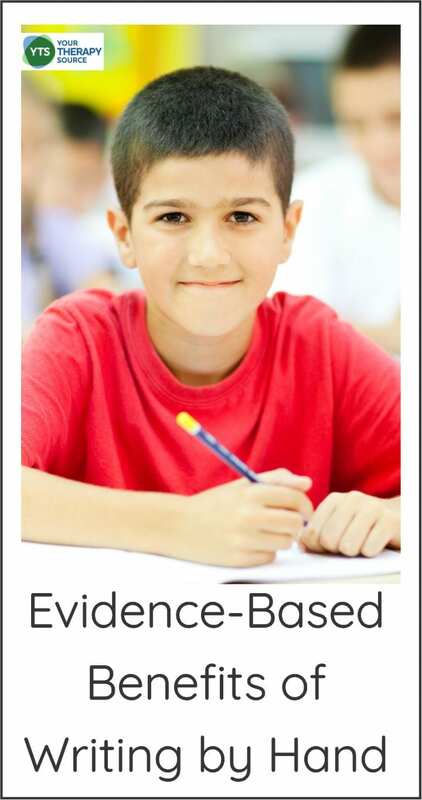 Best practices include research-based methods incorporating the application of developmental and motor learning theories to benefit your struggling learners. Sign up to receive the weekly email newsletter and announcements from Your Therapy Source. You will be redirected to the download link for the FREE printable. 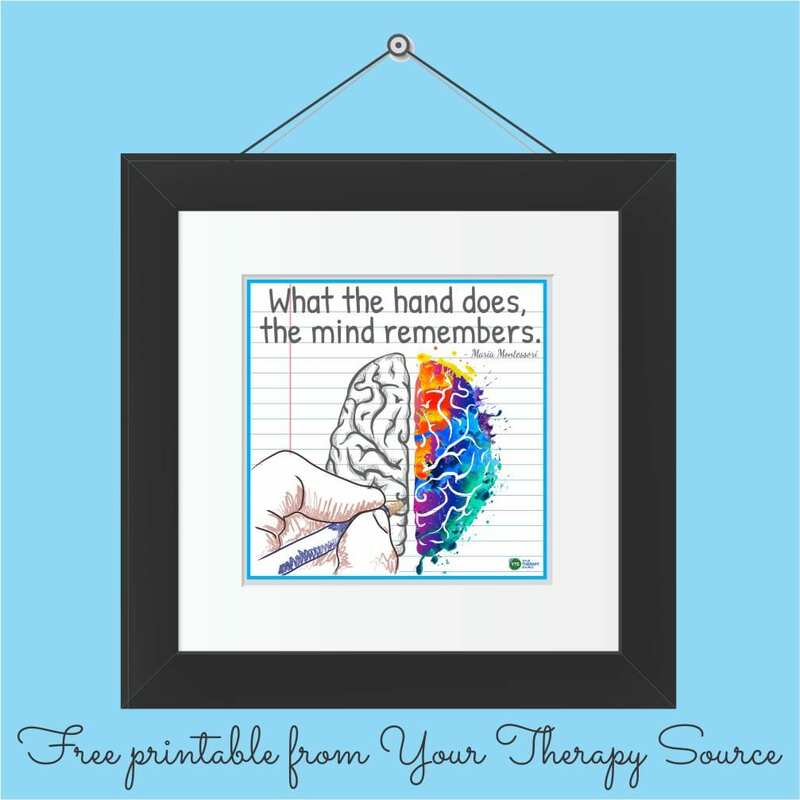 Hang in up in your therapy room, classroom or home-school room to remind everyone of the benefits of writing by hand. The printable is a square image or full size page. If you can not view the sign up box, email us at info@yourtherapysource.com referencing the freebie that you are requesting.